Grilled before your eyes, Koshida provides classic okonomiyaki with your choice of udon or soba noodles and a wide range of toppings. 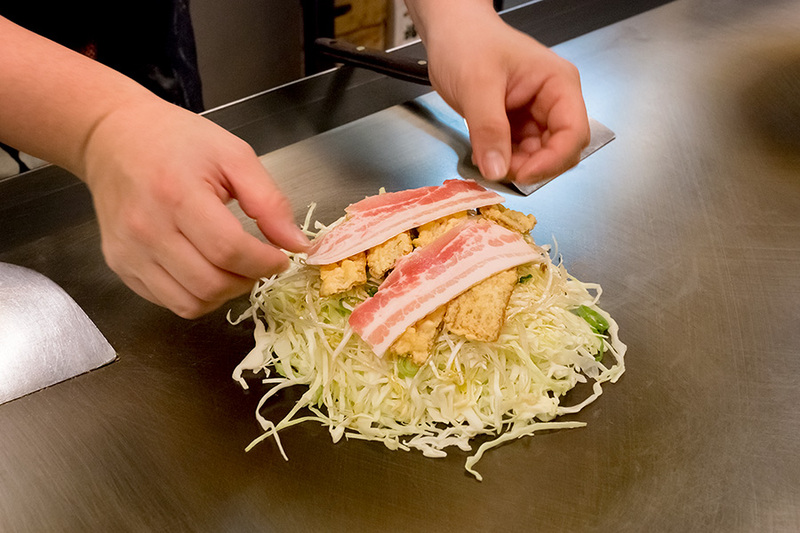 Though pork plays a traditional role in modern okonomiyaki, many other meat and non-meat options grace Koshida’s menu. The cozy interior at Koshida provides a perfect spot for an evening meal. 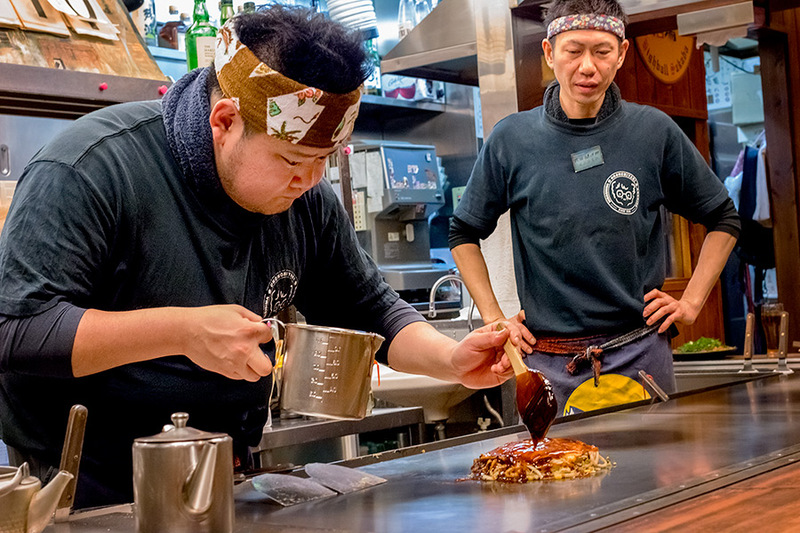 With a practiced hand, Naoki Shimoji applies the special sauce which forms the foundation of okonomiyaki. 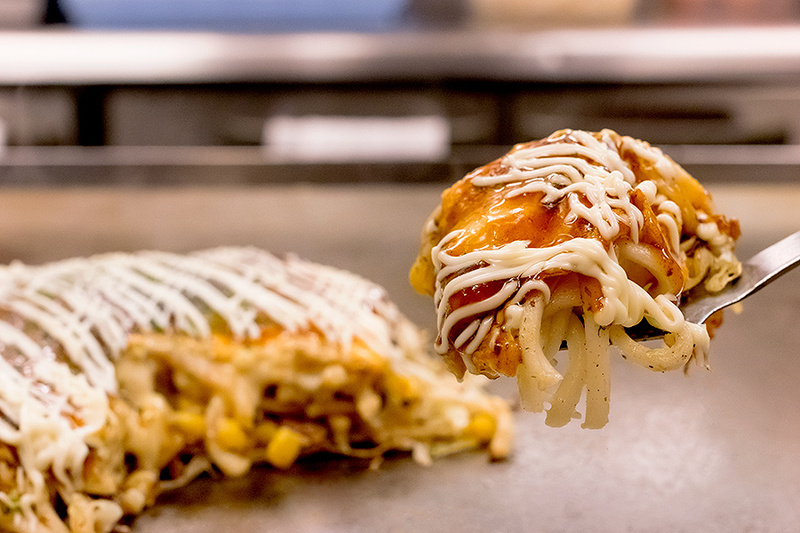 At Koshida, you’ll eat your okonomiyaki the traditional way — hot off the grill with a mini spatula. Good to the last bite. 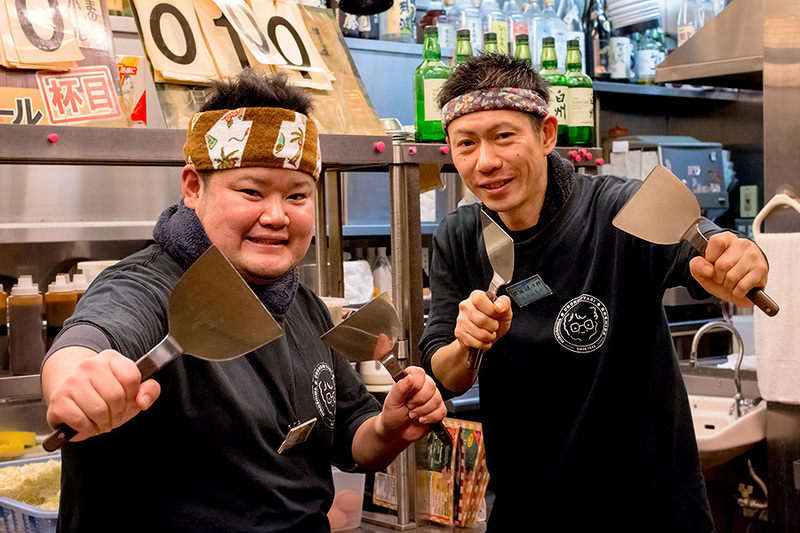 Naoki Shimoji (left) and Kenjiro Narita (right) brandishing their spatulas. When it comes to Hiroshima, there’re a few things every visitor needs do – visit the Peace Memorial Museum, see Miyajima, and eat okonomiyaki. That delicious combination of noodles, cabbage, eggs – and whatever else you want – grilled hot, layered onto a crepe, and drenched in Otafuku sauce will get you every time. “Come for the A-bomb, stay for the food,” I always say. But then there comes the hard part – how do you find the best place to savor this savory dish? With more than 2000 okonomiyaki restaurants in the prefecture (no joke), it can feel a little exasperating trying to narrow things down. However, if you want an okonomiyaki experience as rich in history as it is in flavor, you can’t beat Koshida in the heart of downtown Hiroshima City. Between their late hours (open till 3am! ), stellar reviews, and convenient location in the middle of the entertainment district, a trip to Koshida can fit into almost any Hiroshima travel plan. And considering that their downtown location opened in 1957, Koshida boasts a pedigree almost as old as okonomiyaki itself. Originally consisting of a crape cooked with onions, shrimp, and savory sauce, Isenyoushoku, or “One Dime Western Food,” started out as a snack served by sweets shops. However, as wartime and postwar food shortages made confections a luxury, many sweets shops changed things up to focus on Isenyoushoku instead – Koshida included. Meanwhile, cooks strove to make the dish as filling as possible while maintaining the low price point – a decision which involved recourse to enormous heaps of cabbage and, as food shortages eased and more ingredients became available, the addition of noodles and eventually eggs. When exactly the name switched from Isenyoushoku to okonomiyaki would no doubt prove hard to pinpoint. However the new name – meaning literally “grilled as you like it” – may well have arisen in response to customers bringing in various ingredients and asking the cook to add it to their dish. But of course, nowadays restaurants have more than enough options on hand to keep customers satisfied. Sitting at the grill with my partner, we make our selections from Koshida’s menu (available in English), and the next thing I know we find a heap of cabbage, beansprouts, and green onions sizzling delectably on a layer of crepe batter before our eyes. Shimoji then flips the concoction-in-progress over, crepe side up, and tosses a heap of noodles onto the grill beside it. He adds sauce to the noodles, and next places the veggies and crepe on top. After that comes the egg, cracked straight onto the grill, and again Shimoji moves the whole stack of hot deliciousness on top. Then with two spatulas and one deft motion, he flips the whole thing over, and slathers it with sauce, seaweed sprinkles, and more green onions. And that one is just for my partner. My dish gets the same treatment, only this time with cheese, mayo, and corn. Kenjiro Narita, the other cook on duty, starts out by forming the corn into a heart directly on the grill. “It’s because I cook with love!” he laughs. With that he sweeps it up, layers it onto a pile of sizzling udon noodles, and continues to build the layers up from there, all the while working the grill with incredible dexterity. Koshida purchased the three grills which line their teppanyaki counter 15, 30, and 60 years ago respectively. The fact that they’re still using the original grill purchased when Koshida’s founder, the late Asako Koshida (who Shimoji and Narita both affectionately refer to as “Grandma”), first set up shop downtown, brings the cooks at Koshida great pride. Interestingly, many of the older okonomiyaki restaurants in Hiroshima share the names of their matron founders who, during the war and its aftermath, opened their shops when their husbands went off to – or failed to return from – the war. “We can still use this grill, three generations later, because each cook has cared for it daily for the last 60 years,” boasts Shimoji. At a mere 9 mm in thickness, the antique grill bespeaks of a time when even basic metals were in short supply. In fact, the modern 19 mm thick grill sitting beside it on the teppanyaki counter probably cost a fraction of the price of its elder brother. “Because of the thinness of the metal, this old grill actually bends upward when it’s hot,” says Shimoji. I bring my eyes level to the counter, and sure enough I can see a subtle upward arch stretching across the hot shining surface. “The thicker modern grills don’t do that,” he adds. The different thicknesses also cause each grill to handle heat differently – but that’s not the only variable on the table. Cooking time for okonomiyaki itself changes with the seasons. 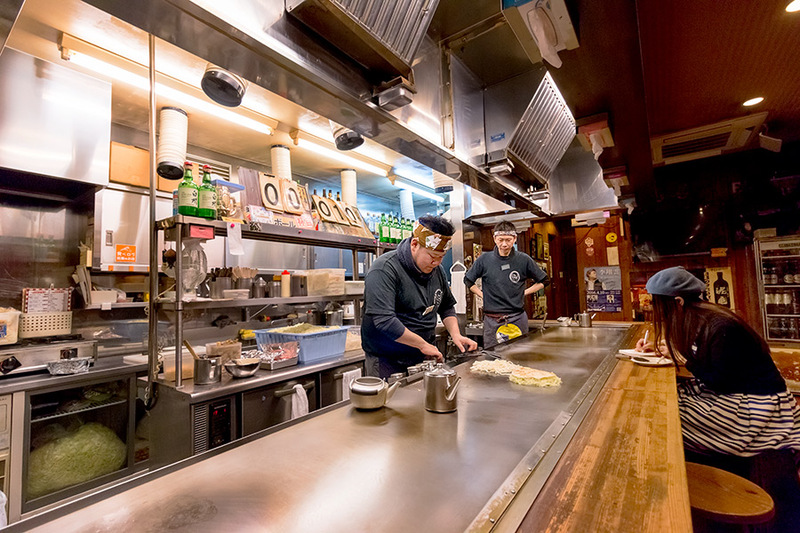 As a result, the cooks at Koshida have to stay in tune with the changes in the local climate, and constantly evaluate the effect those changes have on the fresh ingredients they use. “Believe it or not, I can tell the cooking time just by touching the cabbage,” boasts Narita, at the same time hoisting a handful of the cut ingredient out of a tray nearby. He pauses for a moment, replaces the cabbage, and then sheepishly adds, “I didn’t want to brag like that, but I had to say something – I don’t want people to think my only special skill is making a heart with corn,” he laughs. 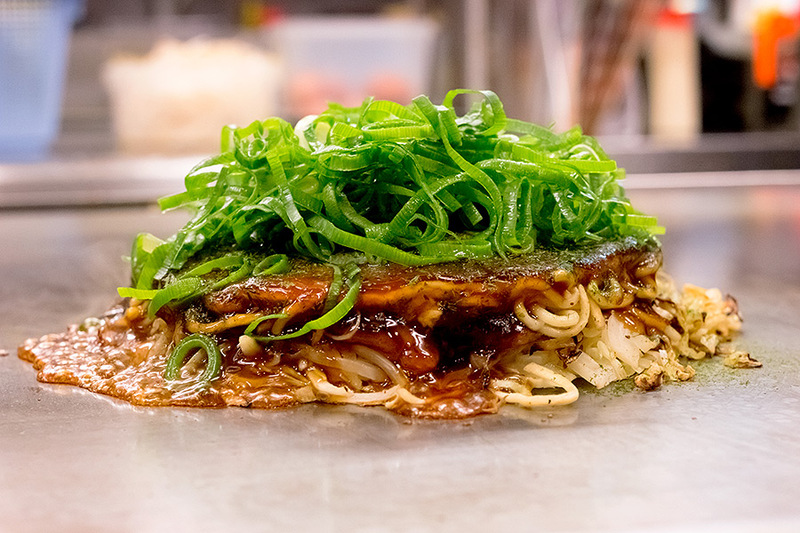 We laugh too, but from the first bite it’s clear he’s not joking on either front – our okonomiyaki is cooked perfectly, revealing a level of attention and, dare I say it, love which satisfies on a visceral level. It’s no wonder Koshida gets a long line out the door every night. Sure enough, as we finish the last delectable morsels of our okonomiyaki, most of the counter has already filled out. We give our thanks to the cooks, and walk through the cloth noren hanging over the door and back into the streets of Hiroshima. Behind us the guests chat happily over the antique grill, it’s gently curving surface sizzling with the savor of okonomiyaki, just as it has for the last 60 years. Serving up a slice of history, cooked with love.